Johannsen moved to the Adirondacks in the 1920s and began designing nordic and downhill ski trails across the Northeast. He worked for the Lake Placid Club, Mont Tremblant, and Stowe Mountain Resort. Working with two other pioneers, Otto Schniebs and Hannes Scheider, he laid out trails on Marble Mountain, the first development on the slopes of Whiteface. Another significant milestone in the history of downhill skiing was the construction of the road to the summit of Whiteface. The Pikes Peak Highway, completed a decade earlier, generated interest in creating a comparable road in New York. This required an amendment to Article 14 of the New York constitution which prohibits development of the state’s forest preserve. As is required by law, the amendment was passed by two consecutive legislatures and finally approved by voters in a statewide referendum in 1927. Construction of the Whiteface summit road began in 1929 with a groundbreaking ceremony led by New York State Governor Franklin D. Roosevelt. Before 1930, skiing in the Wilmington area was primarily nordic — both ski jumping and cross country. Excitement generated by the 1932 Lake Placid Winter Olympics drove interest in downhill skiing. By the mid-1930s, rope tows began to spring up across New York and alpine skiing became established in Wilmington. The Whiteface Memorial Highway was opened and dedicated to veterans of the first World War, in a ceremony led by US President Franklin Roosevelt on July 20, 1935. At a cost of $1.2 million, the road featured a steep average grade of 8%. At eight miles in length, it was billed as longest beginner ski trail in the state. In 1938, Johannsen and members of the Lake Placid Ski Council began clearing an old logging road on Little Whiteface along the route that is now the Wilderness trail. The trail featured a 2700-foot vertical drop and became New York’s first certified Class A racing trail. Several major competitions were hosted on the mountain. 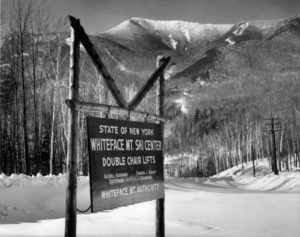 In November 1941, New York voters again approved a change in the state constitution, this time to create 20 miles of ski trails on the north and east sides of Whiteface. A month later the bombing of Pearl Harbor and the American entrance in World War II put the project on hold until 1948. After the war, the Memorial Highway became a major conduit for skiers headed uphill to the new ski area on the north slopes of Whiteface. 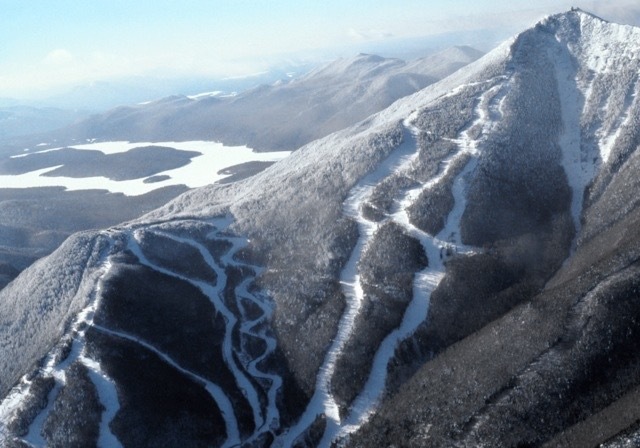 Marble Mountain, one of the Whiteface subpeaks, stood near the route and was the focus of ski development. The Marble Mountain site featured a T-bar and four rope tows serving five trails that had been cut by Johannsen. In April, 1949 Johannsen submitted plans for additional trails at the Wilmington turn of the highway. It had two rope tows on an open slope. The Wilmington trail linked the two sites. Tucker Sno-cats and army vehicles took skiers up the highway to the upper site, while the road itself doubled as a beginners trail. But Marble Mountain was plagued with high winds and struggled to be financially viable. Averell Harriman, an entrepreneur and ski industry innovator, met Arthur Draper, the manager at Belleayre, while skiing in the Catskills. After Harriman became New York’s governor in 1954, he worried about the deficits at Marble Mountain and consulted Draper. They met to ski at Marble and discuss other potential sites for a ski area in New York. Eventually they agreed that the east side of Whiteface was worthy of development. By 1955, the joint legislative committee in Albany reconsidered the Marble development and Governor Harriman authorized an experimental trail on the eastern slope of Whiteface. In 1957 $2.5 million was approved to cut trails, erect two chairlifts and a base lodge. The plan specified that one trail be at least 2,800-feet long, to satisfy requirements for hosting the Winter Olympics. On January 25, 1958, Harriman dedicated the new Whiteface Mountain Ski Center. In 1959-60, two seasons after Whiteface opened, Marble was closed. Marble Mountain’s outmoded trail design and windswept surfaces could not compete with the new ski area. Harriman had pushed hard to make the new ski center a reality. When it all came together, he insisted that Draper serve as the first Whiteface general manager. 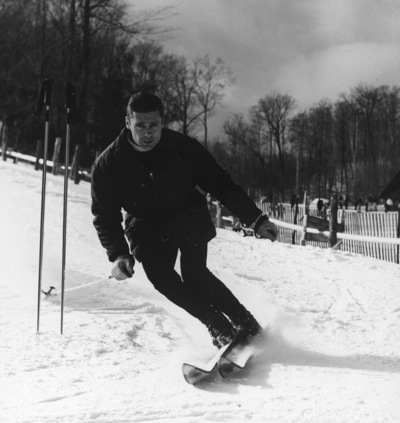 Having already designed ski trails at Belleayre and Gore Mountain, Draper brought considerable talent and experience to the project. In the mid-1930s, while Harriman pioneering the first ski lift at Sun Valley, Draper’s innovative “ride up, slide down” concept helped make Gore a ski destination. Whiteface proceeded through a series of expansions. The first major expansion in 1966 brought the mountain’s vertical to over 3,200 feet. A second expansion — costing $14.5 million — further prepared Whiteface for the 1980 Winter Olympics. In 1980 Lake Placid hosted the Olympic Winter Games with Whiteface as the alpine skiing venue. The mountain featured the downhill, giant slalom, and slalom alpine ski events. The following year, the Olympic Regional Development Authority (ORDA) was established to manage the venues of the Olympic Games, including Whiteface Mountain, and took over the management of Gore Mountain three years later. In 1987 another constitutional amendment allowed trail widening and mileage limit increases at all three state owned mountains. Under ORDA from 1998 to 2008 more than $26 million was spent on expansion and improvements. During these years, Whiteface became a training venue for ski racing and hosted US National and World Cup competitions. Nearly 75 years later, the legacy of the 1938 racing trail on Little Whiteface continues to grow. The mountain remains an Olympic Training Site and hosts major ski events including the U.S. Alpine Championships. Whiteface Mountain is the fifth-highest mountain in New York State. Set apart from the other High Peaks, the summit offers a 360-degree view of the Adirondacks, Vermont and Canada. Located in the town of Wilmington, the mountain is home to the ski area with the greatest vertical drop in the eastern United States. Well done. I am really looking forward to your new “history” section, especially when my childhood home of Gore is added. The Stats section is especially impressive: wow, that’s a lot of vertical, even on Little Whiteface. Perhaps someone closer to WF can add some more details about the dates of the various expansions. When I used to ski Whifeface, prior to and just after the 1980 Olympics, I was always disappointed about how narrow the area was, with just two trails coming down from the summit chair (then a double). The expansions through the 80s and 90s have really made Whiteface world class. Great job, and another reason HR stands out from the rest of the ski blogging world! Great job on the history of Whiteface. Any plans for a big picture overview of what skiing was like across the state back in the day? Nice history. I think the vert of lookout is wrong. You’re using the elevation from the lift but the vert drop really should be calculated to the intersection with Boreen. It’s way more the 1500 vert. I would add the World cup freestyle events that WF has hosted the last 10+ years somewhere in the end. Missing mention of the landslide that took out the first base lodge – I’ve heard about this but not in great detail. Who knows more about this? General comment is that started really strong and then petered out a bit as it got to the recent history. Key events of more recent history that need to be added – gondi, facelift, snowmaking improvements, lookout addition, SLIDES! Good stuff. I know it’s not easy to put this kind of thing together without a great deal of support and corraborating background info. The write up left me with a few questions: where exactly on the mtn were the Marble Mtn trails and lifts and were they connected to or overlap any part of the current layout? Is it correct that the Wilderness trail cut back in the ’30s was not part of the Marble Mtn ski area and did not get lifts until much later as part of the modern ski area? Don’t believe you mentioned the recent expansion with the new Wilmington Trail in recent history. Does this new trail have any relation to the old trail of same name that was supposedly connected to Marble Mtn ski area? Is it correct that there were no downhill ski events (lift served or non-lift served) during the 1932 Lake Placid Olympics at Whiteface or anywhere else in the region? The 1953 USGS Lake Placid Topo quad map shows ski trail development on Whiteface Mountain just before development of the current ski area on the slopes of Whiteface and Little Whiteface. It will give you a good idea of where Marble Mountain is in relation to the current ski area . This map can be viewed at the following web link: http://docs.unh.edu/NY/lplc53nw.jpg Scroll over the image and click on it to zoom in. Then pan to Whiteface Mountain. The map depicts the ski trails near the top of the mountain and the Wilmington Trail which connected them to the Marble Mountain Trails to the north. The current Wilmington Hiking Trail (not the new ski trail) follows the path of the old Wilmington Ski Trail. The Marble Mtn Base Lodge is still onsite and is used by SUNY Albany as an atmospheric research center. There are still traces of the trails, lifts and associated facilities in the woods. Also, the Class A trail is somewhat accurately depicted on the side of Little Whiteface Mountain. Downhill skiing was not included in the winter Olympics until after 1932. Therefore, there was no downhill event during the first Lake Placid Olympics. The course for the 50k event traversed the nearby Sentinel Range twice and did include a fair amount of downhill, as well as uphill. All human powered. As one old timer told me: “There was no such thing as downhill skiing, or cross country skiing, there was just skiing”. Good history account! Loved the picture of Averell Harriman. Who is the woman – looks like a winter carnival queen? When did we stop tucking our ski jacket into our pants – very natty! An interesting account of AH’s start of Sun Valley is contained here. Also a great account of the invention of the chairlift (banana conveyor belt!). There is lots more to add to Whiteface’s history, but I don’t have a lot of the info. I see from the Whiteface sign “Whiteface Mountain Authority.” I believe this was switched to The Adirondack Mountain Authority, perhaps when Gore came along – but I have no specifics. Of course control went over to DEC then to ORDA where it sits today. The other interesting history is the ski school at Whiteface. All the big mountains wanted a big name – generally European – to head up the ski school. I can’t remember the name of the famous director at Whiteface – but he always skied with a white ear band. Karl Pfeiffer maybe. Thanks for the encouragement and input. It’s not simple to source historical material. Much is in print or in people’s minds. That’s one reason we want to get it down. I’d actually assumed that Whiteface would be one of the harder histories to write, but it was fascinating and I got a lot of support from the Wilmington Historical Society, NELSAP and ORDA. Plus I found some other resources that take a lot of digging but provided valuable insight. I was surprised to find information on newer developments harder (like Lookout, Slides) to find. My idea is that these histories will be living documents, and reader input will be part of the process. It’s just too overwhelming (for me) to try put together this much history and ensure that it’s complete. PLEASE post any links below that can help us make this a complete resource. If you have information or links about other NY mountain, find the listing and post it there. Again thanks to all. If anyone has detail on the images above, or you have other images or information to share, please post below or email us – NYSB. The woman in that picture is figure skating pro, Priscilla Snow, who taught figure skating in Lake Placid during the 50’s and 60’s. This is a great overview of Whiteface Mt. My Dad was one of the ski pioneers from Lake Placid and a member of the early National Ski Patrol and Lake Placid Ski Council. He told the story many times of he and several other local men from Lake Placid spending the day on Whiteface in early winter of 1941, building a shelter (lean-to) for the racers at the top of the racers trail (location of the current Wilderness Trail). They returned to town and went to a local watering hole to have a few beers only to find a somber atmosphere. That date was December 7, 1941, and they’d learn about the bombing of Pearl Harbor that afternoon. He had some great stories about the early days. Wish I’d recorded them. I’m curious, did Whiteface host any other World Cup Downhill races other than the 1980 Olympic downhill? I think the ski instructor was Tony Matt.